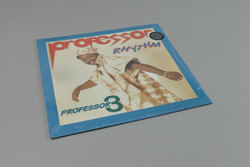 Professor Rhythm - Professor 3. Vinyl LP, CD. Bleep. Perhaps the most excited we’ve been about a new Awesome Tapes from Africa in a while! We first heard the house/bubblegum/kwaito vibes of Professor Rhythm via Ari Beautiful Swimmers years back and were left smiling for weeks. Real sweet summer time music here! Working behind the scenes in backing bands and as part of pop groups, the solo music of Mr. Rhythm is maybe his best. These tracks were made when US imports of house, rap and other genres were making their way into South Africa and inspiring young musicians to build their own take on these sounds. The result? Infectious house cuts that still sound fresh today.